This is a thread to describe in very short words some movies depicting lives of the Christian community of India . Some movies have indeed been made with many christian characters and showcasing their community . Before starting---some of my thoughts about the christian community of India . The Christian community of India is characterised by it's forwardness compared to other communities of India . The women have always been bolder than other Indian women , wearing exposing western clothes even when India was in the depths of socialism and backwardness in the fifties and sixties . Their lifestyle was comparatively westernised , with dancing and parties in the western style and a piano in every house . For this reason , in the era before Indian city women began to get westernised , movies always used to show a christian girl as the dancer in a club for example . Drinking and smoking was also common in the Christian community including women when other Indians used to shy away from it because of sheer backwardness and religious restrictions of conservative households . Not surprisingly , the partly christian state of Goa became the party capital of India attracting westerners in the hordes . However with the rise of right wing political parties in India from the nineties onwards , the Christian community began to be accused of two things . First , there were accusations that Christians are trying to convert Indians to their religion . That foreign foundations were paying the lower castes of hindus money to convert them to Christianity . These accusations peaked when India was ruled by the Congress party between 2004 to 2014---whose leader was Mrs Sonia Gandhi , who is a roman catholic of Italian origin . The other accusation was that their real loyalty is to Christian majority countries like USA or European countries and not to India at all . In answer to these accusations I would like to state that successive censuses of India have shown that the Christian population of India is dwindling as percentage of Indian population , and so the efforts of missionaries have been singularly failures , if those attempts are indeed large scale at all---something that is doubtful . And Christians have never been caught doing anti India activities like terrorism or spying for any western country . In fact Christians have been among the most law abiding communities in India . Many Christians have joined the armed forces and laid their lives for the country . Communal riots have not happened in areas where Christians are in large numbers . 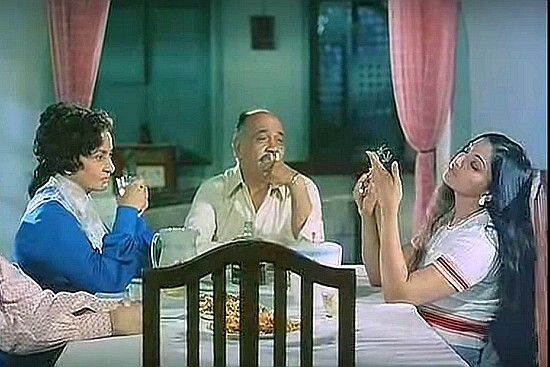 In Bollywood, Christians are portrayed as drunkards. Just like Madrasis were portrayed as Aiyaiyo and idli sambar. That foreign foundations were paying the lower castes of hindus money to convert them to Christianity . These accusations peaked when India was ruled by the Congress party between 2004 to 2014---whose leader was Mrs Sonia Gandhi , who is a roman catholic of Italian origin . It cannot be denied that there have been active attempts at conversions. I know of instances in rural and backward areas of Maharashtra where the missionaries would set up relief camps and only help those who converted. I have seen people brainwashed so much that they would also kneel in hindu temples and pray exactly how they do in churches. Having said that, I agree terrorism and overt communal tensions were not involved. Most famous christian bollywood character then - Anthony Gonsalves! The Christians across India are probably more diverse than Hindus. The forward ness or westernization you have mentioned apply more to Anglo Indians and somewhat lesser to Goans. And Goans and Parsis were westernized by being in close contact with British in Mumbai. Else, Christians in Kerala have practices almost like Hindus. Coming to Hindutva rise leading to anti Christian sentiment, it is more a tool to counter Sonia G. Before 93, there was hardly any anti Christian statement from Hindutva forces. In 93, there were widespread reports of atrocities against Christians in Pakistan. There were protests by Christian organizations in n India outside Pakistan embassy. Strangely first reports of Hindutva forces targeting Christians started then. Face if this was Dilip Singh Judeo in MP ( now Chhatisgarh). Did ISI infiltrate VHP and provoke such activity? Last edited by sarv_shaktimaan; October 23rd, 2017 at 06:50 PM. It is my belief that Ashdoc started this thread with one thought and ended it with another. His brain drifted from movies to culture to social injustices ... and a bit about terrorism for added effect. Rating: 2 1/2 stars out of 5. It had dimple kapadia in a bikini. All Christians in Bollywood movies talk like .. Man tum ko kya mangta. for once I agree with Outlook..
Hindi movies over the decades have offered many hoary old stereotypes of minority communities. There are the Parsis, who used to be offered as comic relief, arriving in a grand old car packed with kids and piloted by a bespectacled little man in a black conical hat. There are the Christians, often embodied in plump, stern nurses, saintly priests, or well*meaning but perpetually liquor*soaked uncles. These quick* and* dirty shorthands range from merely shallow to downright offensive, but for better or worse they are part of the filmic vocabulary, frequently pressed into service. That was not backwardness .. that was just plain improper to use your clinic , a place of work for a compounder.. to make love. Christian or not, that BS should not be encouraged. Go do whatever you like where you live or a hotel, but not in my clinic. Next thing you know the clinic becomes a love joint and allegations of giving place for sexual activities. Last edited by sarv_shaktimaan; October 24th, 2017 at 03:06 PM.